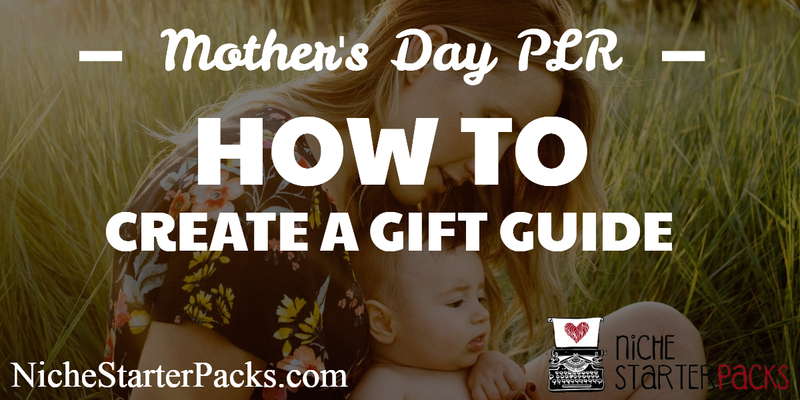 Mother’s Day is coming up and last year I created a HUGE Mother’s Day PLR Bundle last year that I’ve put on sale. I decided to offer it a little ealier this year because I know that this holiday is earlier in other countries. There are several PLR bundles in the Mother’s Day PLR from me that you can buy and if you’re able to I’d buy them all. I’d take the product reviews from the upsell that is offered and add all of those to your site. Go over to Fiverr can have someone create an eCover. Then add all of the gift ideas into one document. While you’re adding all of the guides images. This would make a great opt-in for anyone going to your site. You can use this type of PLR on mom, parenting and lifestyle blogs. You can also use it on blogs that talk about recipes, small appliances, grandma’s, new moms, gardening, wine, coloring, wine, dogs and cats. You don’t have to use all of the gift guides. Use the ones that you need. The gift guides are filled with 10 ideas. In the upgrade you’ll get 50 product reviews. These all have the slant of Mother’s Day, but the wording could easily be changed to reflect women and not the special day. These product reviews are made to work with the gift guides. You could easily link from the Ultimate Mother’s Day Gift Guide you already made to your site. People love product reviews and this will help them figure out which gift is the best for their mom. Right now I am offering my Mother’s Day Gift Guides at a savings of 65% off- that is an amazing deal! You’ll get 10 different gift guides that each have a different slant to them. I found the most popular keywords that people were searching for and created a Gift Guide for these. I’ve seen these types of guides used as Opt-Ins on very well-known magazine sites. You’ll get a total of 50 product reviews and 5 “Top 10” flower lists. In this pack you’ll also get 5 “Top 10” Flower Arrangements. Flowers are the second most bought present for Mother’s Day. I’ve also come up with another 10 articles of “Top 5” Mother’s Day Gifts that you can purchase as well. The product reviews in the upgrade were mostly from Amazon, but these Top 5 articles are based off from a site called Personal Creation. The affiliate program goes through Commission Junction, so if you don’t want to use Amazon this is a great alternative. All of my Mother’s Day PLR is on sale right now, so it is definitely the time to buy it. You can use it for this particular holiday to boost your traffic or take the time to change the articles to reflect gifts for mom – which is also popular!